The first time I bought a Champion Reverse Weave sweatshirt, I didn't understand why it was so much better than other sweatshirts, I just knew it felt right. Since then, I have compared the ultra long cuffs and inset reverse weave side panels and fully realize why it is a superior sweatshirt. 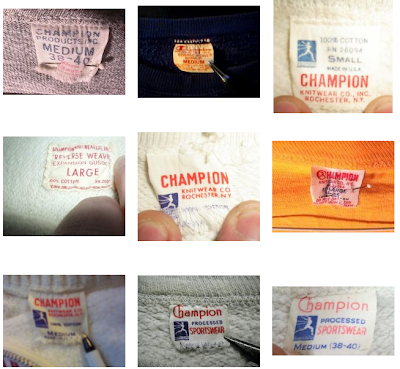 Not surprisingly, there is a collector's market for these fine sweatshirts and our man Andy Beach has collected photos of eBay sellers exposing the tags on their wares. eBay photo collecting is a wonderful, cheap way to satisfy curiosity and build reference libraries of images. I collect scans of Chinatown postcards, while Bobby Green collects photos of early accessory turn signals.